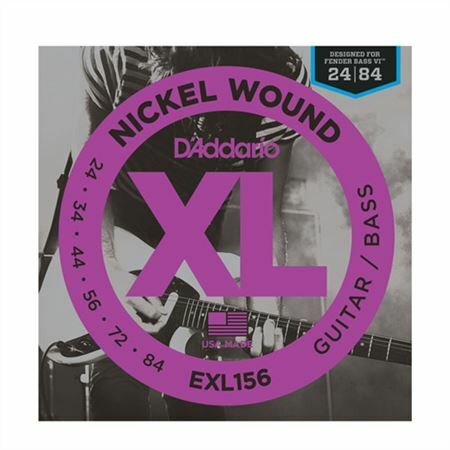 Shop D'Addario EXL156 XL Nickel Wound Fender Bass VI Strings from AMS and enjoy Fast & Free Shipping. The DAddario EXL156 Nickel Wound Fender Bass VI Strings are custom designed for the Fender Bass VI, which is tuned to E, an octave below a guitar in standard tuning. Each string is designed to bass scale lengths and tapers, but with guitar sized ball ends for retrofit on the Fender VI. The EXL156 Fender Bass VI strings are precision wound by D’Addario with nickelplated steel onto a carefully drawn, hexagonally shaped, high carbon steel core. The result, strings with long lasting, distinctive bright tone and excellent intonation, is ideal for the widest variety of guitars and musical styles.